Quality assurance is a service and monitoring department of the company Loch. With their help, the quality standard of products from the Loch e.K. is not only maintained, but is also continuously improved to meet the constantly increasing customer requirements at all times and therefore to achieve 100% customer satisfaction. Their procedure is influenced by the knowledge that high non-conformity costs are avoided through early fault detection and that only prevention and high process reliability ensure a high quality standard. Our quality management representative for Loch e.K. coordinates and monitors the management system with regard to the quality segment in all areas of the company. He promotes awareness for customer requirements and the applicable statutory provisions. The continuous control is monitored with 3D coordinate measuring devices and compared with the data from the CAD model. Quality professionals check the processes and products with roughness measurements, hardness tests, tensile strength tests and the visual comparison of contours and form-free shapes. 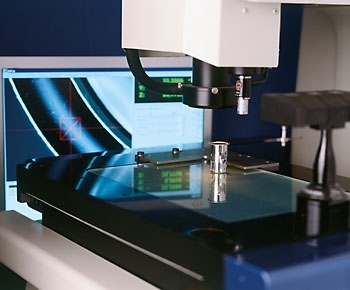 CNC-controlled measuring devices allow serialmeasurements within a short period of time. ur company is certified according to DIN EN ISO 9001, ISO 14001, TS 16949. We strive to always meet the product quality requirements and delivery commitments and to continuously improve the products and processes in terms of quality and environmental requirements. Ensuring quality is our top priority, because we also want to be a competent partner for our customers in the future.